Protein is a vital nutrient, whether you're male or female. Increasing protein intake will help to maintain lean muscle mass and your body burns more calories when you eat protein than when you digest either fats or carbs. Ideal for individuals with an active lifestyle or those who want to increase their protein intake, Precision Engineered Whey Protein Lean provides additional benefits from the added fat burning ingredients of Green Tea Extract, CLA and L-Carnitine. With less than 2g of fat and 0.5g of sugar in each shake, this great tasting vanilla protein shake is perfect post workout or in-between meals to keep your protein levels topped up - and satisfy any sweet cravings. 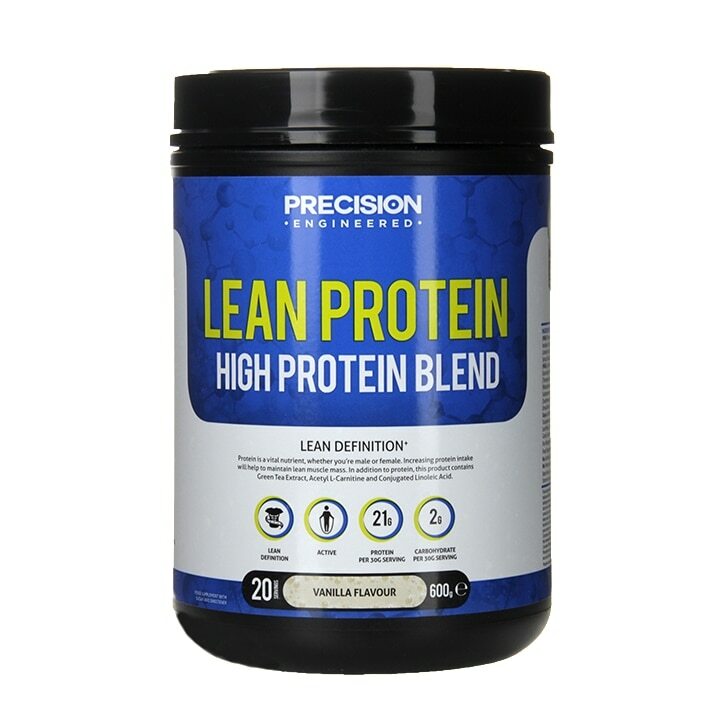 With three forms of premium grade protein as well as a comprehensive amino acid profile, Precision Engineered Whey Protein Lean is the perfect choice for your training, fitness and weight loss goals. Our Whey Protein is batch certified, aspartame-free and quality assured which means it goes through stringent tests to ensure the highest quality standards. Use 2-3 servings of Whey Protein Lean daily to help tone and maintain a lean physique. Either between meals or as a low calorie meal alternative. For Men: Add 4 scoops (approximately 60g) of Whey Protein Lean to 350ml of ice cold water or low fat milk and shake for 10 seconds. For Women: Add 2 scoops (approximately 30g) of Whey Protein Lean to 175ml of ice cold water or low fat milk and shake for 10 seconds. Ensure adequate hydration during and after training - Minimum of six to eight glasses of water daily. No Artificial Colours or Flavours. No Preservatives. No Yeast, No Fish, No Porcine. Precision Engineered Whey Protein Lean Powder Vanilla is rated 4.2 out of 5 by 23. Rated 5 out of 5 by Brooksy from On the other side of 45 I’ve been using this product for 4 months and it helps me a lot doing the work I do in a carpet wear house. Then train at night MMA it helps me rebuild better when I have a rest day. I would recommend it and worth a try. Rated 4 out of 5 by Melody Maker from Versatile flavour, confusing instructions! Enjoy the flavour and it’s versatility to add to many different ingredients for protein shakes. However, the instructions for the correct quantity is confusing. You’ll need to do your maths ! I believe the instructions could be made much simpler to understand as its easy to add the incorrect amount if you don’t understand the correct formula in which to work out the right dosage. Rated 5 out of 5 by Orman from Protein Whey Have used this for some time. I find it excellent as a shake with extras in. Rated 3 out of 5 by MattP from Gritty formula I bought this whey protein as advice given that it was really nice when I was in store days before buying other supplements when arriving home I ordered online because I needed time to think about the product. Really disappointed that it’s not nice & is very gritty not a smooth drink at all. Rated 5 out of 5 by Mary 2 from A boost when metabolism is low, It really helped when appetite down, gives a protein boost!